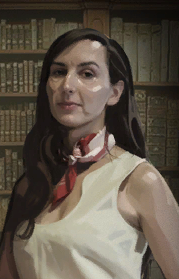 Caroline as seen in a portrait in the Portal 2 chapter, The Reunion. She's the backbone of this facility. Pretty as a postcard, too. Sorry, fellas. She's married. To science. An unseen character in the single-player campaign of Portal 2, Caroline was the personal assistant to former Aperture Science CEO Cave Johnson, until later becoming his successor. Not much is known about her character, as she is only heard briefly through a small portion of Cave Johnson's prerecorded audio messages. From the recordings, it is clear Cave Johnson holds her in high regard, remarking that "she's the backbone of this facility". Johnson later appointed her as his successor as one of his dying wishes. Although the amount of time she became CEO is unknown, it is clear that Johnson had praised her enough to have her essence extracted into a core to oversee the Facility's operations, the core of which became GLaDOS. Caroline is voiced by Ellen McLain. When it becomes a distinct possibility that Cave Johnson may not live to see his artificial intelligence project realised, he makes it clear that Caroline will manage the Enrichment Center and, if need be, his place in the artificial brain as well. As Chell explores the old facility with the potato battery form of GLaDOS, it emerges that GLaDOS has a recollection of Cave Johnson and unwittingly finds herself replying to his voice recording instructions in the same manner to that of Caroline. It becomes clear that Caroline's mind was inserted into the AI that became GLaDOS, a fact GLaDOS silently recalls on her own as she listens to the recordings. GLaDOS' demeanor slowly changes as her memories of Caroline emerge, and she claims to have turned over a new leaf. After defeating Wheatley and regaining control of the Enrichment Center, GLaDOS thanks Chell for being her "best friend" and for helping her realize "where Caroline lives in her brain". The Announcer then proceeds to state that she has promptly deleted Caroline from her system. It is never made clear how much of GLaDOS was Caroline. The line "Now little Caroline is in here too" from the closing song "Want You Gone" suggests Caroline is still somewhere in GLaDOS' memory. Voice actress Ellen McLain stated on a panel at Anime Midwest 2011, that to her belief, Caroline is not deleted at all. Below is a portrait of Aperture founder Cave Johnson, with a woman standing beside him. Though unconfirmed, the most obvious candidate is that the woman is Caroline. The portrait appears in a hidden room after completing the first test chamber in the chapter, The Reunion. When found, GLaDOS will comment on the portrait, stating that both the man and the lady seem familiar. Players will earn the achievement "Portrait of a Lady" after the portrait is found. Portrait depicting Caroline by Cave Johnson's side. There are unused Caroline voice files in the game files, which suggest Caroline was against the idea of implanting her mind into the AI. Valve Visual Designer Laura Dubuk was the inspiration for Caroline's appearance. This page was last modified on 7 July 2013, at 19:08.